Gujarat State Examination Board Has Published Notification For TAT Higher Secondary(Teacher Aptitude Test)Exam 2018. Candidates Can Apply for TAT-HS Exam from 16-10-2017 from official website ojas.gujarat.gov.in. 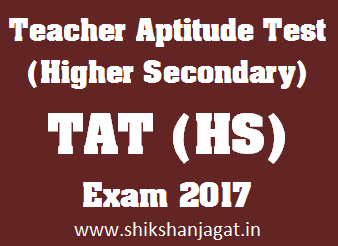 More details Related TAT Higher Secondary(Teacher Aptitude Test) Exam 2017 are as Given Below. 0 Comments "TAT Higher Secondary(Teacher Aptitude Test) Exam 28-10-2018 Provisional Answer key"